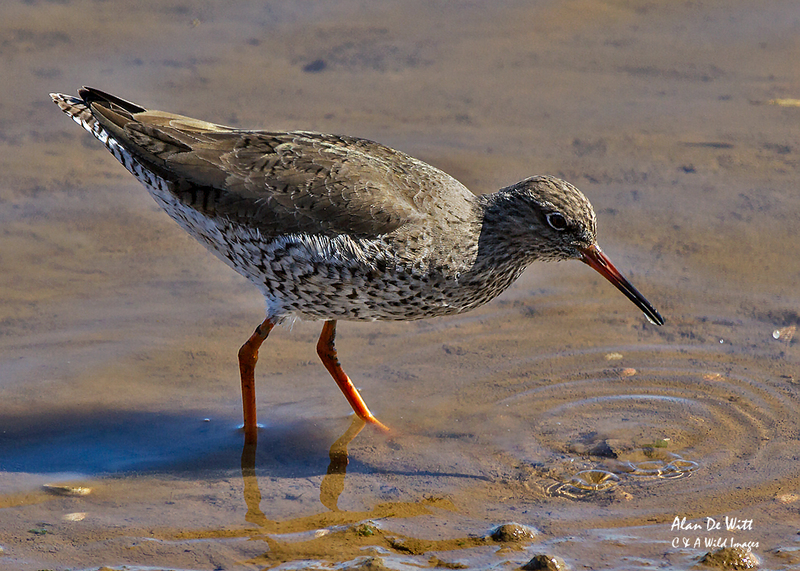 Redshanks are a common wader found, year-round, on the marshes of the north Norfolk coast. 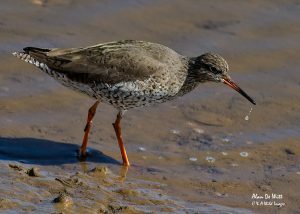 At any time of year, on a visit to RSPB Titchwell, Snettisham or the NWT Holme Dunes you often see redshanks probing their bills into the mud for insects, worms, and crustaceans. This year has even seen them returning to breed on nearby Roydon Common, the first time in 40 years. 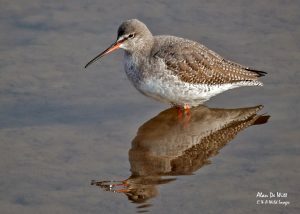 Winter sees the numbers grow as more birds arrive from Iceland, spending their winters in the UK. 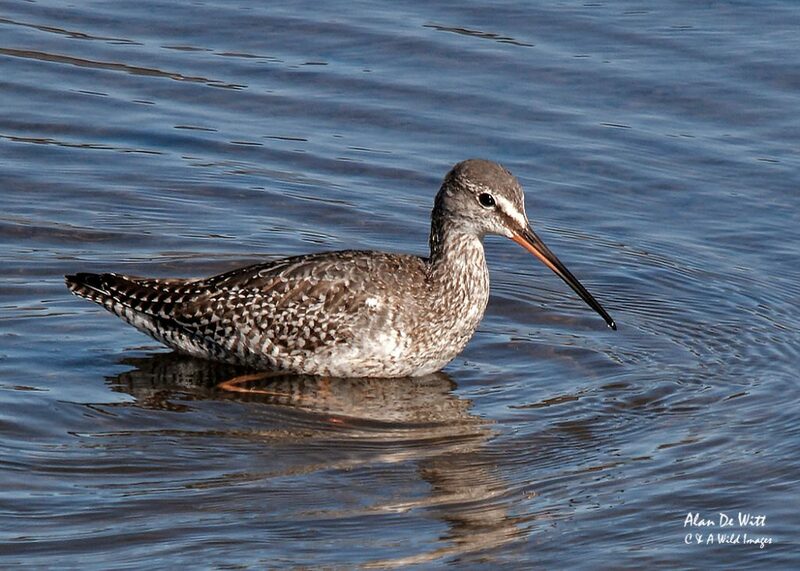 The Autumn and winter months can also bring a small number of the much rarer Spotted Redshanks. Most of these birds are passing through the UK but with a few overwintering on the marshes in this part of the UK. 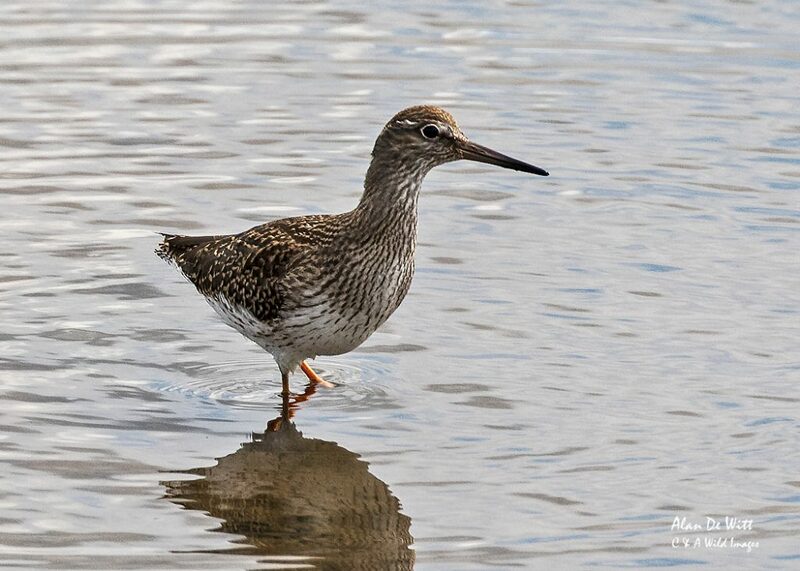 At this time its not uncommon to hear about local sightings of Greenshanks on their migration to their African wintering grounds. 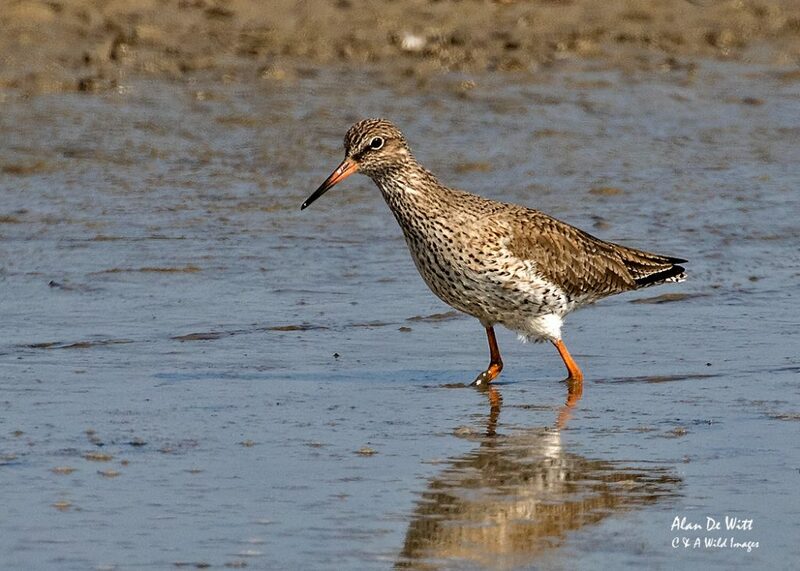 In recent years, a number of these have overwintered on the estuaries of SW England. 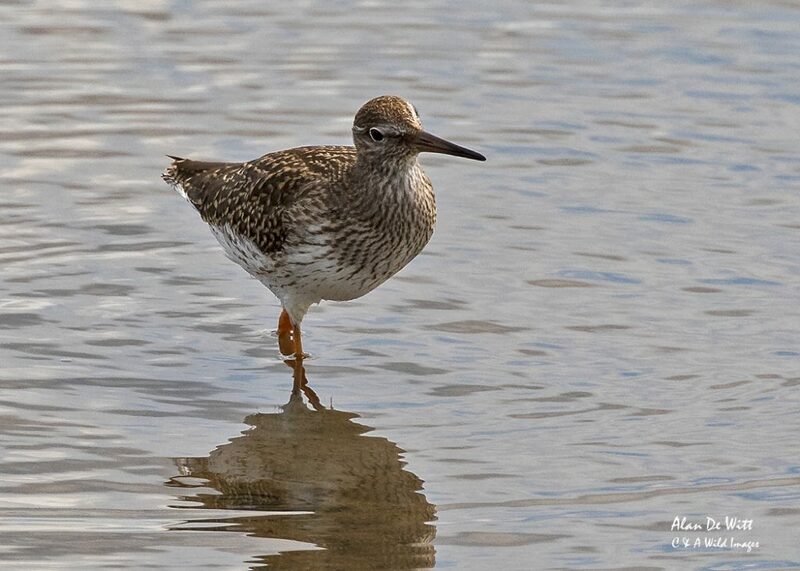 Often when visiting the RSPB Titchwell, when reports of spotted redshanks in the area, I’m asked by visitors “is that one of the spotted redshanks”. 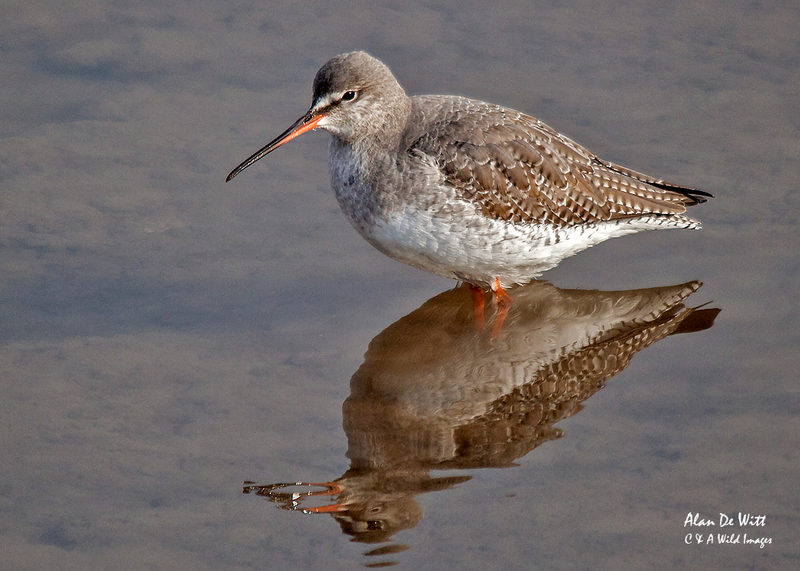 Telling the difference between the species can be difficult, partly due to the fact that during the year even the common Redshank can look very different. 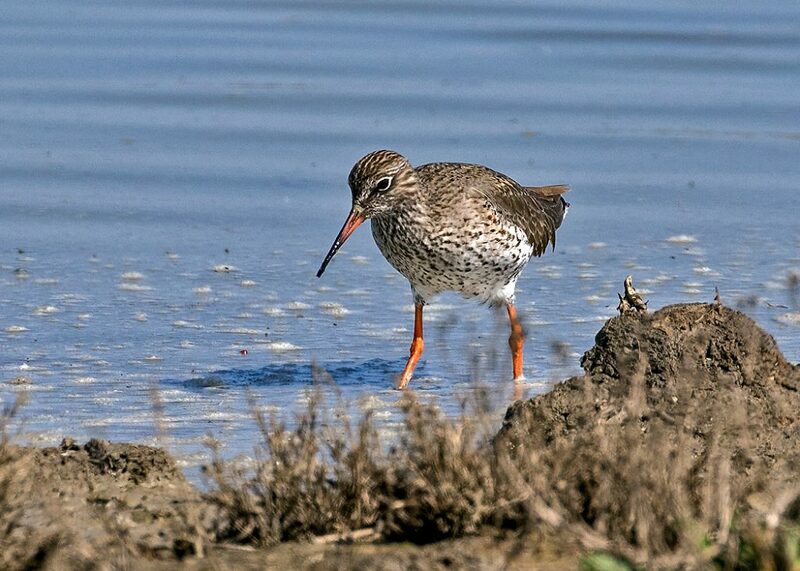 Just to add to the confusion in summer if you come across a Spotted Redhank they are black and Common Redshanks are spotted. 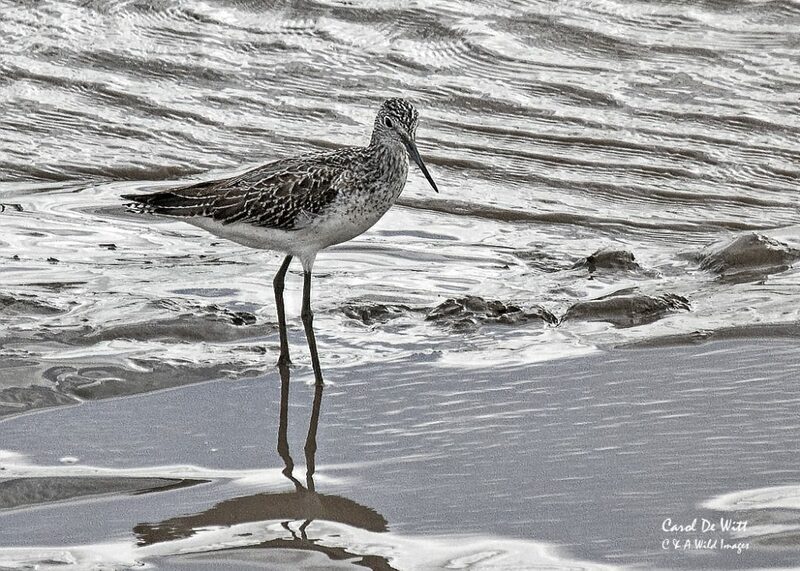 Greenshank on the other hand are much easier to recognise with their long green legs and slightly up-turned slightly greensish bill. 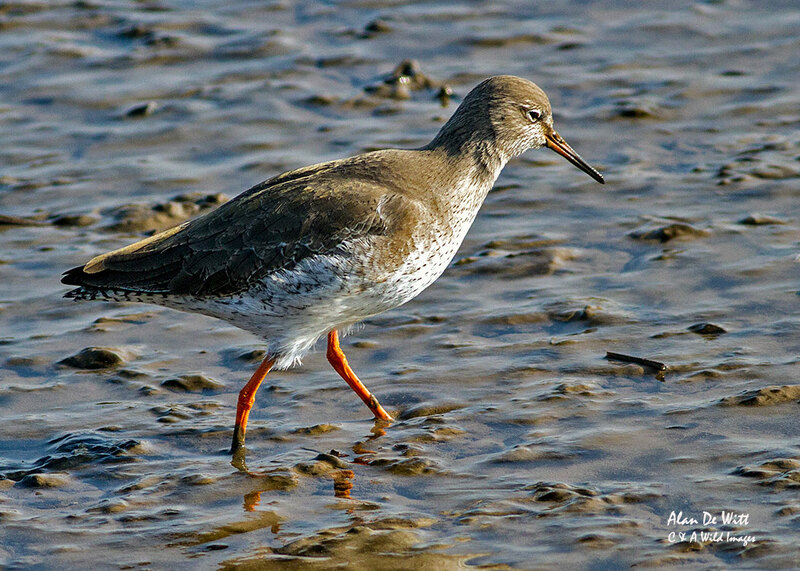 Distinguishing between the birds can become easier by looking for a few key features.Spotted Redshank are a more elegant and leggy bird but you really need the common Redshank to make the comparison. One useful rule of thumb is the length of the bill. Spotted redhanks’ bills are longer and thinner, with only the lower part red. 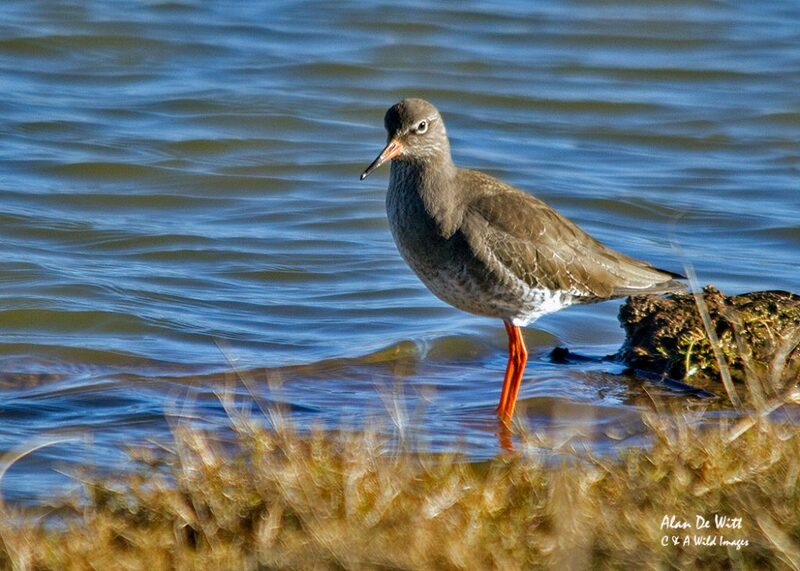 Whilst Common Redshanks have a relative short bill with a red base. 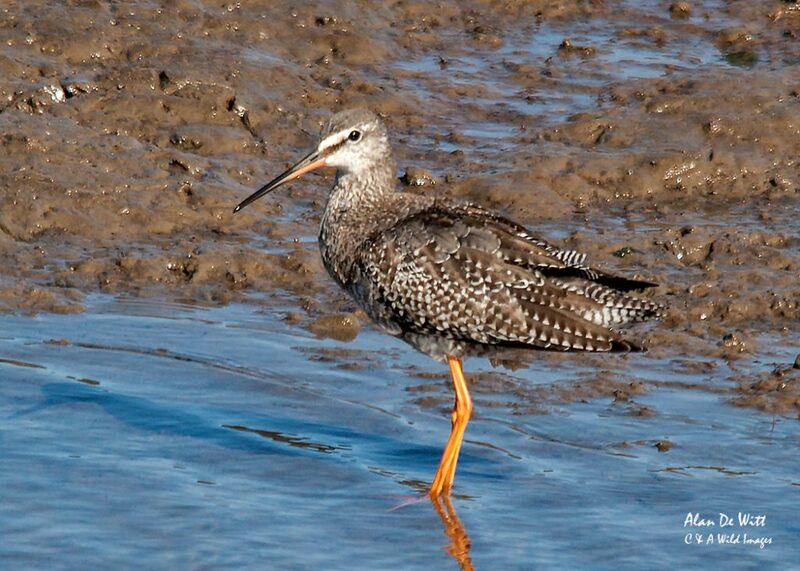 Although Juveniles can lack any red, making them look a very different bird. 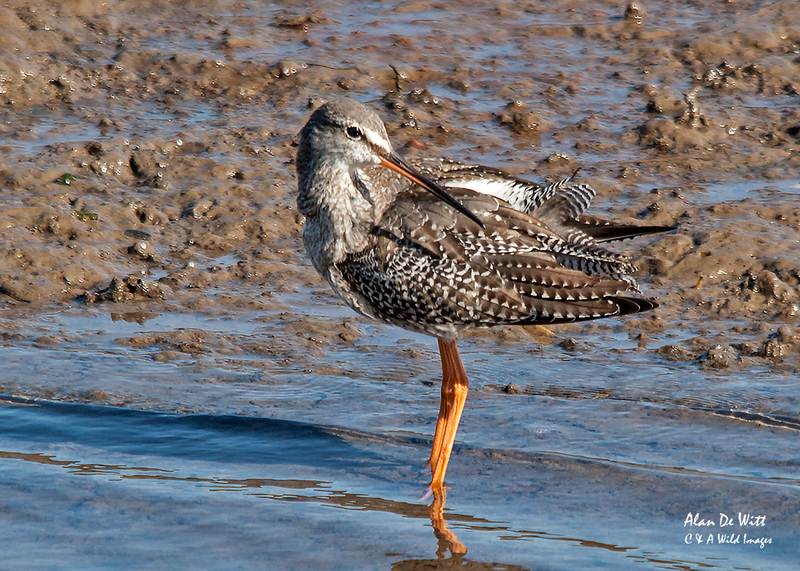 Like the bills the Spotted Redshanks’ legs are longer. The time of year can be a good guide, with any spotted shanks tend to appear in this part of the country in late August and overwinter until spring. 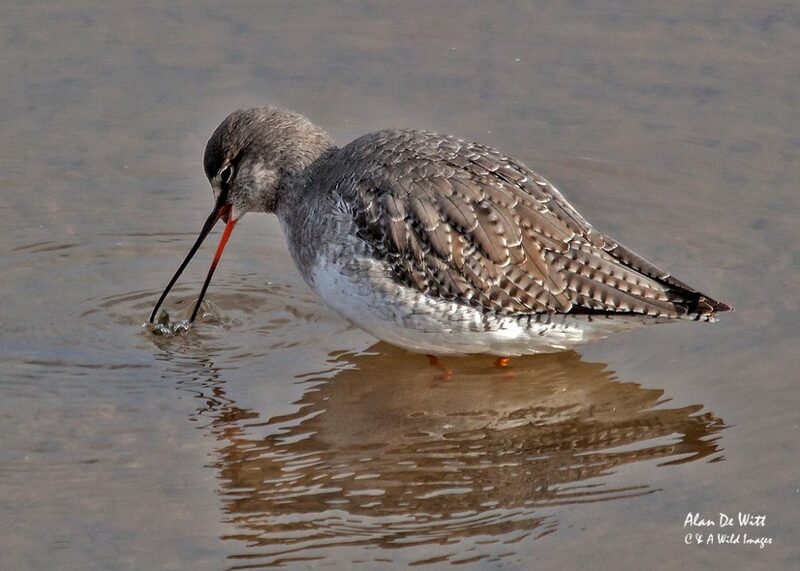 Also in winter Spotted Redshanks can look much whiter, where as the commons look much darker in colour. Another key feature of Spotted shanks in winter are the prominent white eye stripe and eye-ring, which is less obvious in the common shank. Finally when they fly, the spotted shows plain wings were as the common have a white triangular wedge up the back and a wide white triangle on the rear. 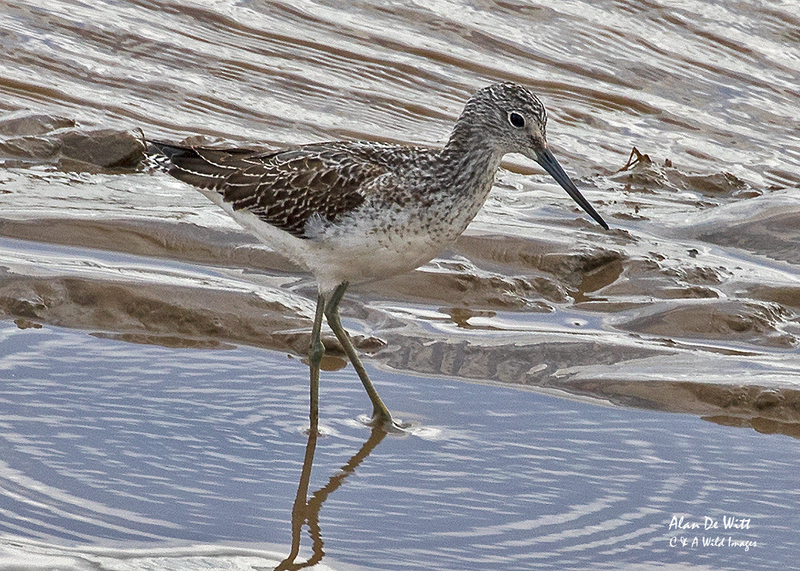 Greenshank on the Parrett estuary, SW England.